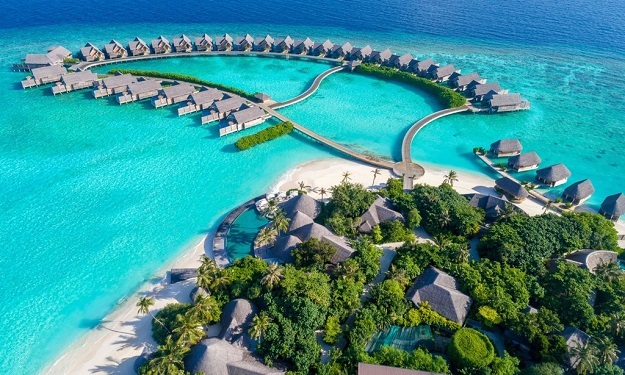 Milaidhoo Island Maldives offers reinvented luxury and spacious outdoor living epitomizing the true contemporary Maldives. 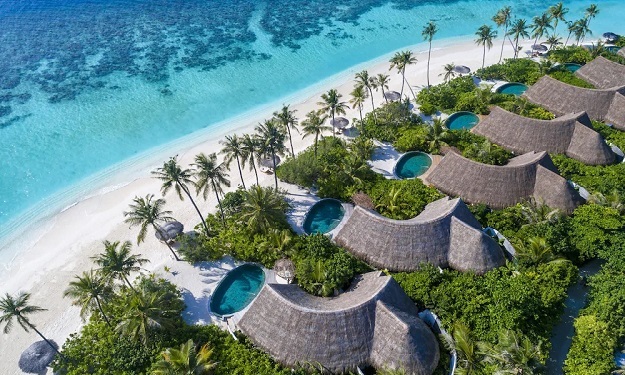 This understated yet undeniably sophisticated 5 star boutique resort spans 13 acres with its design and concept proudly rooted in Maldivian culture. 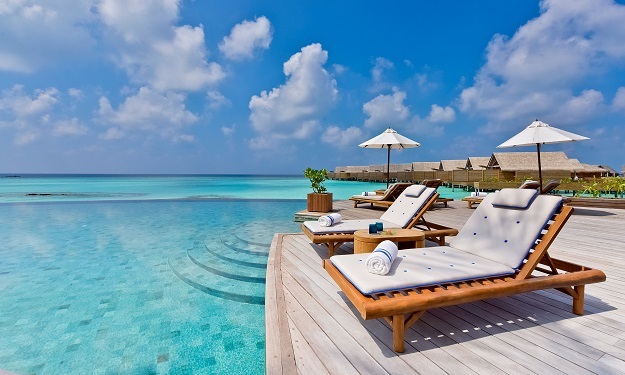 The vast overwater deck stretches out into the secluded turquoise lagoon. There is nowhere in the world you would rather be. Consists of a private freshwater infinity pool. 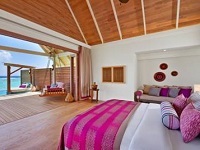 From the comfort of your outdoor daytime bed ­enjoy the endless sea view that becomes stargazing as night falls. Privacy is valued in this spacious two-storey residence. This is island chic living at its very best. 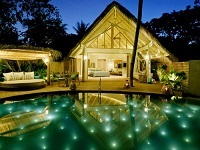 Consists of a ground floor living area, upper level sleeping area and a freshwater infinity pool. The generous relaxation, dining and bathroom areas open a new chapter of outdoor island living. Consists of a private freshwater outdoor pool, oversized indoor and outdoor bathroom areas and an extensive beautiful private beach area. 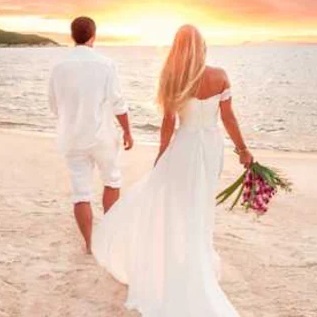 It is the pure white sands and lush tropical green gardens that draw you in at first. 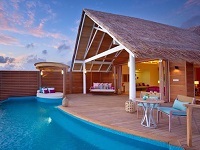 You head to your own private retreat where you discover informal, re­invented luxury at its finest. Includes a private freshwater outdoor pool and an oversized indoor and outdoor bathroom areas. 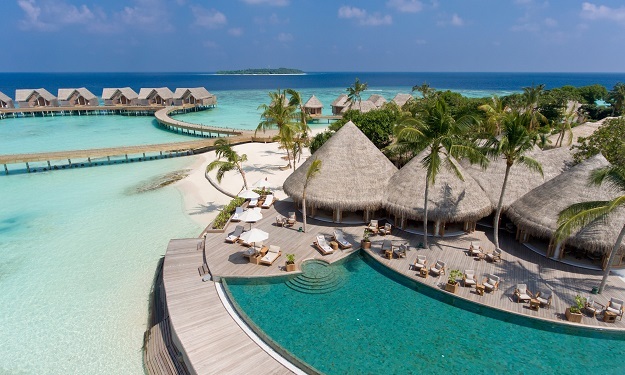 Set over the crystal clear water you find the stylish and intimate island spa. The open-air pavilion hosts a series of yoga and meditation sessions while soft sounds and rich aromatic scents of coconut, lime, sea salt and herbs fill the private treatment rooms and beauty lounge. All you have to focus on is your mind, body and soul. The watersports and dive centre will come fully equipped to let you discover underwater beauty of Baa Atoll. The watersports and dive centre will come fully equipped to let you discover underwater beauty of Baa Atoll. 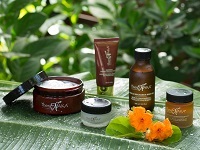 Explore the rich exquisite beauty that surrounds you. Experience group dive and snorkelling activities, or opt for a more personal excursion – all with our highly skilled instructors. 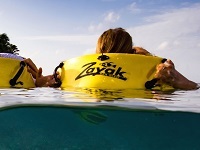 On-site windsurfing, kite surfing, kayaking, pedalo boats, rowing, catamaran, Dhoni sailing and SUP (Stand up Paddling) invite you to enrich your spirit of adventure. 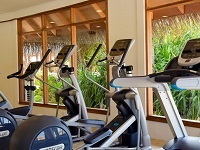 Open 24/7, the state-of-the-art fitness facility offers a place to work out and work up a sweat. For those wanting to retreat and relax, head to the library and games room. Settle into one of the comfortable armchairs and select a book or a board game.The Pavilion will host a series of daily yoga and meditation sessions. 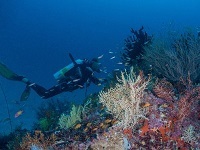 The island has a rich house reef within 50 metres and you could easily excess from the beach. 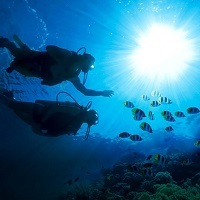 Snorkeling is also a good exercise but you often don't notice it as you are captivated by amazing sea life. Let's talk about love. 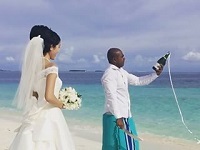 Let's talk about how you and the one you love most in the world can say 'I do' on the shores of Milaidhoo Maldives. As the temperatures rise, enjoy the cool refreshing menu of the Pool Bar. Amidst the swimmers and sunbathers you discover your very own oasis with exotic fresh fruit juices, infused waters and mouthwatering snacks. By night, the Pool Bar transforms into a laid-back lounge. Ease into the comfortable lounge chairs, sip on fresh tropical island cocktails and listen to live music while the waves rhythmically lap against the sand. 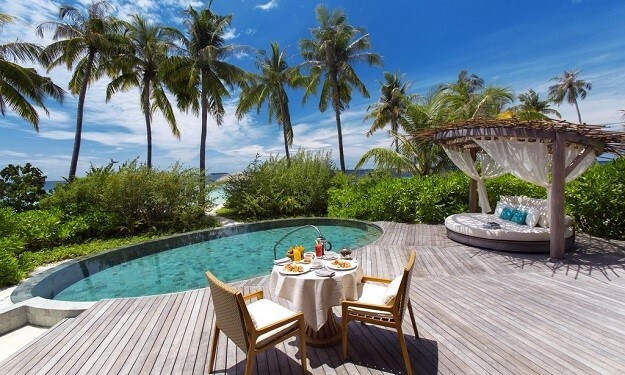 Basking in the sun, the elegant open-air Beach House restaurant is the perfect place to start the day. On offer – an array of fresh daily specials and à la carte dishes. As night-time falls, savour an international mix of Mediterranean and Asian cuisine served in a stylish casual dining setting. The enticing scent of chargrilled fish, fresh lime and chilli draws you to the Grill Restaurant. Just steps from the beachfront you find yourself in the most intimate and romantic dining settings, where effortless casual elegance meets fine dining. Enjoy world-class cuisine brimming with the freshest meat, seafood and vegetarian dishes. 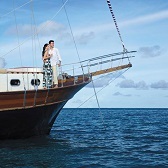 Three elegant traditional Dhoni sailing boats set the scene for an unforgettable sensory experience in stunning surroundings. 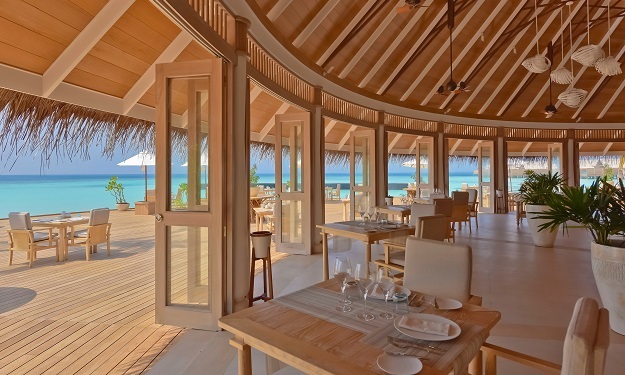 Here, you will find our signature restaurant, one of the very finest restaurants in the world where every table offers spectacular views across the endless azure sea. Exceptional dishes, expertly prepared by Maldivian chefs, take you on a journey to new gastronomic heights rich in flavour, colour and texture. It is quite simply an experience like no other.